Supplementing with regular B5 or pantothenic acid will not necessarily increase the body's levels of pantethine since this conversion process is tightly regulated. In 1996, AOR released the first Canadian standalone vitamin B5 in the form of Pantethine. 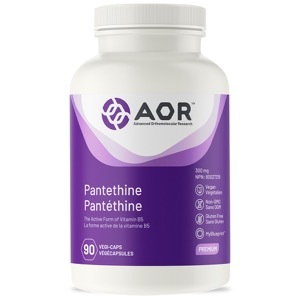 Unlike many others since, AOR's Pantethine provides a pure, effective form of this important nutrient at a research-supported dose. Primary Uses: Low pantethine levels can result in blood lipid imbalances. Pantethine's role in the body is related to coenzyme A, which is involved in hundreds of metabolic processes including energy production and fatty acid synthesis. Pantethine regulates the production of total cholesterol, triglycerides, LDL, and HDL, supporting healthy cholesterol levels, a role that is not shared by pantothenic acid. Secondary Uses: Coenzyme A is required for the synthesis of stress hormones in the adrenal glands. An inadequate supply of pantethine may therefore result in adrenal insufficiency, which compromises immunity, energy, metabolism and overall well-being. Coenzyme A is also essential for phase II liver detoxification, and pantethine may protect against fatty liver degeneration and other types of liver damage better than regular B5. Pantethine is an excellent natural support for those with abnormal blood lipids, for those dealing with constant stress and for those with liver disorders. Take 3 capsules daily with food, or as directed by a qualified health care practitioner. Int J Clin Pharmacol Ther Toxicol. 1986 Nov; 24(11): 630-7. Clin Ter. 1989 Mar 31; 128(6): 411-22. J Atheroscler Thromb. 2000 7(1) 55-8. Vopr Pitan. 1985 Jul-Aug;(4) 51-4. Atherosclerosis. 1987 Nov; 68(1-2): 41-9.